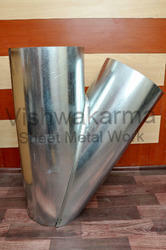 Providing you the best range of Sheet Metal Ducting Fittings such as Fabricated Y Pieces, Fabricated Round Duct Pipe, Ducting Pipe Bends, GI Round Pipe Clamps, Round Ducting Pipes, Y Pieces and Bands and many more items with effective & timely delivery. We are a noteworthy manufacturer and supplier of a comprehensive range of Fabricated Round Duct Pipe. Offered range is mainly required for blow room, carding & comber machines, cotton conveying ducting, waste collection ducting and exhaust ducting. This is widely demanded by a large number of clients owing to their corrosion resistance, low maintenance, peak performance and durability. These pipes are mainly used for drainage and irrigation system. We are ranked amongst the foremost firms, engaged in offering a qualitative range of Round Duct Pipe. 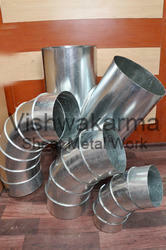 These duct pipes are widely demanded by our valued clients for their quality and durability. Offered duct pipes are generally used for carding & comber machines, blow room, waste collection ducting, cotton conveying ducting and exhaust ducting. 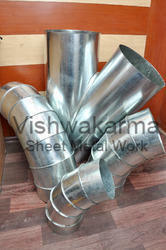 These duct pipes are supplied within given time frame. 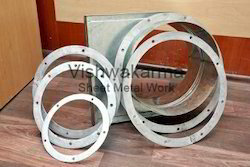 most of used in G.i Round Ducting works.... join m.s flange. Backed by the rich industry experience, we are manufacturing and supplying high quality Round Ducting Pipe Bend that is used for the transferring of chemical, gases and various fluids. Provided pieces and bands can be modified according to clients’ specific desires. Offered products are manufactured by our professionals using supreme grade raw materials with high level of precision. These products are widely used in water treatment plants, sewage plants, sugar mills and various other fluid related applications. 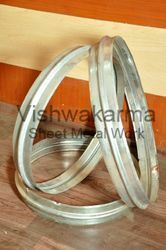 We are recognized as the foremost manufacturer and supplier of an immaculate range of Fabricated Round Y Piece ( T ). Our experts manufacture this range using high grade raw material in conformity with international quality standards. It is highly acknowledged for the finest quality, rugged construction and durable nature and is widely appreciated by the clients. We provide this range on numerous specifications so as to meet the demand of customers. Leveraging on the vast industry experience, we have come up with quality proven gamut of Y Pieces And Bend. Clients can buy these industrial pieces and bands from us in various sizes and specifications. Provided industrial pieces and bands are well manufactured by our industry-experts. Post production, these industrial products are examined on wide-ranging quality elements to ensure their conformity with set industry standards. Our clients can avail from us Ducting Ring that is incredibly durable in nature. In line with the global quality standards, these round rings are manufactured using high grade mild steel. Also, we check these round rings on diverse parameters before their finishing dispatch in order to make certain that these round rings are in conformity with the worldwide quality values. 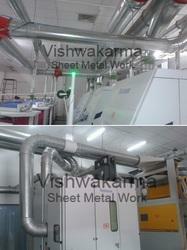 With the assistance of our experts, we are engaged in manufacturing and supplying a wide gamut of GI Duct Bend. 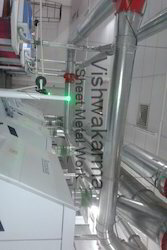 This range is for air, fume extraction and liquid supply under low pressure. The offered bend is manufactured with the use of premium quality cast iron and the contemporary technology in line with the set market standards. The offered range is known for great quality features like high durability, corrosion resistance and cost-effectiveness. With rich industry experience, we are manufacturing and supplying a wide range of Round Duct Fitting (Textile Industry). 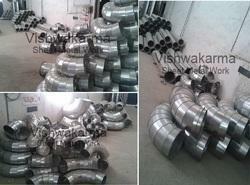 Provided round duct fittings are manufactured by our skilled professionals using enhanced quality material. 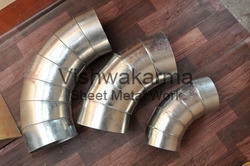 These round duct fittings are identified for their superior quality, rust-free nature and durability. Our experts can customize these products depending on different needs of our clients. 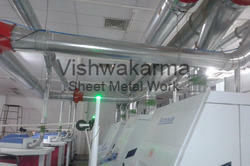 Capacity 0.6 to 5 mm thik. We are one of the leading organizations of GI Round Pipe Clamp, known for their surprising features. All these pipe clamps are broadly demanded for diverse applications, and can be customized as per the provided detailed by our respected clients. In accordance with the international quality standards, these pipe clamps are manufactured by our professionals using ultra modern technology and optimal quality galvanized iron.